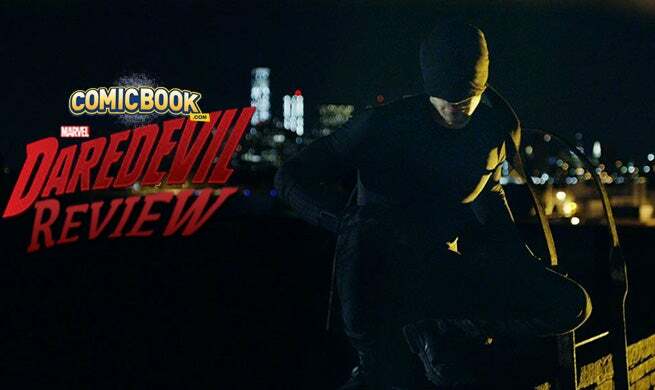 Comicbook.com has seen the first five episodes of Marvel and Netflix's Daredevil. And though there's still eight episodes to go before we can judge it as a whole, it's safe to say that Daredevil is a series without fear. As the rest of Marvel’s cinematic Universe is content to produce fun, if fickle, entertainment for the whole family, Hell’s Kitchen demands more from its viewers with an intriguing storyline, electrifying set pieces, and a cast of foible characters ready-made for an Emmy award. Which is to say, Daredevil is great. Like the titular character himself, this series is bold in its distillation of the Daredevil mythos. Taking Matt Murdock’s greatest storylines—i.e. Frank Miller’s—and presenting them as one hard-boiled crime Noir, Daredevil demands more from its audience. This series isn’t some casual night at the movies. To appreciate Daredevil, you’ll have to bear a complex, intricately woven plot, truly devious characters, and acts of violence that would give The Punisher pause. But if you can weather the storm that show runner Steven DeKnight has concocted, you’ll be rewarded with Marvel Studios’ most intricate offering yet. The series wisely jumps into present-day Hell’s Kitchen, where viewers meet Matt Murdock: fledgling lawyer by day, hard-nosed vigilante by night. In an age overstuffed with linear “secret origin” films, it’s both refreshing and interesting to see Daredevil buck the trend with a non-linear approach to Daredevil’s backstory. As Matt dives headfirst into Hell’s Kitchens’ seedy underbelly, his present-day actions are interspersed with flashbacks to the past. It puts the series on a fantastic pace, feeding enough breadcrumbs in each episode to inform the uninitiated, but also hold diehard fans’ attention span. That’s not to say the main conflict between Daredevil and Hell's Kitchen’s underworld is an after-thought. Quite the opposite, in fact. Daredevil’s main plot is a slow burn; a delicate game of connect-the-dots that, while slightly confounding at first, quickly forms into a cunning crime story. Frank Miller’s fingerprints are all over this series as moralities are tested, faiths are broken, the carpets are only inches away from being completely pulled from under you. This isn’t a series to watch while ironing laundry or sending e-mails. It requires—and deserves--your full attention. Speaking of commanding the audience, Daredevil’s ensemble might be Marvel’s best casting move since Robert Downey, Jr. said “I am Iron Man.” Every character, down to Wilson Fisk’s main goon, is a carefully constructed figure. Charlie Cox nails his turn as Daredevil, channeling Daredevil’s faces as a swashbuckling adventurer and tormented protector with equal ease. Through Cox, we understand how Matt can toe the lines that he does, while still keeping his marbles in one sack (for now, at least). But while Cox’s Matt flirts with the darkness, Vincent D’Onofrio’s Wilson Fisk worships at its altar. Every scene with Fisk is a blood-soaked treat. Fisk is reshaping Hell’s Kitchen in his image as well, but there’s no anguish in choices he must make. Every despicable move Fisk plays is done almost with complete objectivity, but it’s through D’Onofrio’s nuances that we see a fire brimming in the corners of his eyes. Fisk is a twisted individual, but only those entrust—or anger—him enough can see the true Kingpin within. Fisk is like Walter White at the end of Breaking Bad: A man who’s sacrificed every ideal to realize his goals, but is so far gone, he neither notices or cares. But as smoothly as Daredevil lands the urban crime drama, it also remembers its roots as one of the best comic book series around. As much as the show makes you think, it also propels you from one bare-knuckled action sequence to the next. Daredevil’s scraps are brutal, unforgiving, and—most pleasing of all—entirely plausible. There’s nothing elaborate or fanciful the series’ fight scenes. Daredevil brawls as a main raised in a boxing gym would, throwing beleaguered punches while fighting through fatigue. When Daredevil delivers his final punch, he puts every body into before collapsing from exhaustion. It’s a painful example of how any real vigilante would engage a fight, making even The Dark Knight’s fight scenes look like an episode of Dancing With The Stars. A word of caution for the squeamish, however. Daredevil is brutal in its violence. Nothing is left to the imagination as bones, brains, and blood are flung across the camera with a touch of glee. This is Marvel’s—and Netflix’s—most brutal series to date. Like the Frank Miller work it honors, Daredevil is ahead of its time. It’s the most mature comic book series to-date, rivaling the quality of Marvel Studios’ best feature films. It raises the bar for all other shows to come—and not just comic book derivatives. Daredevil is a series that strikes the perfect harmony between engrossing tale and high-stakes adventure, daring everyone to join it for the next era of serialized storytelling.